Time to seek warmer weather! This is my fourth visit to Portugal this year and, looking out of the office window here in the Garden of England, Kent, I am glad to be leaving the English climate for now! However, it won’t be all fun and games over there…we have a client only taking a small group of 28 golfers over to Vila Sol this year for a 2 day, 2 night event..but I always find overseas events harder in terms of hours spent checking and double checking. Also this year I have been disappointed with Vila Sol and the administration which has made event management harder. I have sent so many emails chasing up information that I need. We also heard Friday last week, that the L’Olive room we have hired for the Gala dinner has been double booked by them and we have been kicked out. I decided that I should stand firm (having had this reservation in for a year) but they did say this has been a longer standing booking. I may just do some Sherlock Holmes work and see if they are not telling me any pory-pies when I am there!!! Anyway, the client will never know of these problems and I will come with my long check list on arrival on Wednesday. So…what’s the message behind anybody who has a budget that wants to run a golf day overseas.? ?…let us organise the event for you as you can see, it’s not as easy as it looks. 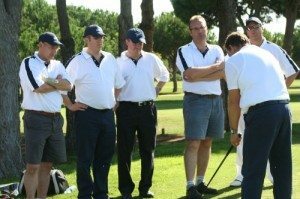 Oh yes and I have asked about hire clubs at least 3 times, whether for the first day, we hire them direct at the course where the group are playing (Laguna) or from Vila Sol for both days. All I got three times was OK!!! Yes sure it’s fine but if they could explain, that would be great!